Kim Townsend is Community Voices Outreach Manager with the Media Trust, and when we met up recently at the community enablers workshop I asked if Kim would like to share maybe 10 learning points from her extensive experience with their innovative projects. It turned out just five gave us a wealth of insights – including digital media isn’t just for young people, as this photo shows. 1 It’s about people and communities first, technology second. When the department for Communities and Local Government first launched Community Voices back in 2008 it was originally called Digital Mentors. Media Trust won the bid to deliver the programme and after some deliberation with CLG we decided to change the name to Community Voices to reflect our belief that any intervention into communities needed to be about people first and the tools being used second (in this case digital media, but we believe the same would go for any type of project – sport, arts, gardening etc). What is more we believed that in order for community media projects to work well they needed to be conceived and lead by the communities themselves. Our approach was to empower communities to lead their projects themselves through training, mentoring, funding, and outreach support, and thus sustainability was built in from the core. This idea has served us well over the past three years and we have seen many communities grow and achieve some amazing social outcomes through digital media. For example 71 year old Margaret from St Helen’s applied to us for support for her and her friends from the ‘Monday club’ at Morley Way Community Centre to get online for the first time. Her application explained how they had heard about online technologies but didn’t know how to access them and so they felt left behind. Because the application came from the community themselves there was a good demand for the computer classes that we supported them to organise. Fifteen ladies attended weekly classes for 6 months and are now able to do online shopping and be more in touch with their friends and families as you can hear them talk about in this film. I don’t think that there would have been the same result if this had been a top-down process instead of a bottom-up idea. During the first two years of Community Voices we piloted several difference levels of funding, £1,500, £7,000, and £14,000. At the end of the two years we found that the difference each community made to their lives, and the quality of the media product produced, didn’t differ greatly between the funding levels. What made the biggest difference was the community drive as mentioned above, and the level of support they received from volunteers and our Outreach Manager. In an independent evaluation we had done the recipient communities themselves said that the outreach support they received was the most valuable of all the types of support we offered them. Media projects in themselves don’t actually cost that much to do, a lot can be achieved with low cost equipment and sharing local resources. But for a community who have never used digital media before, someone to guide them through the decision making process of things like what equipment to buy, how to run their project, how best to get an audience for what they have produced, and how to avoid the common pitfalls is invaluable. There seems to be an assumption that digital media and young people go hand in hand, so much so that I think digital media projects for older people are sometimes overlooked. 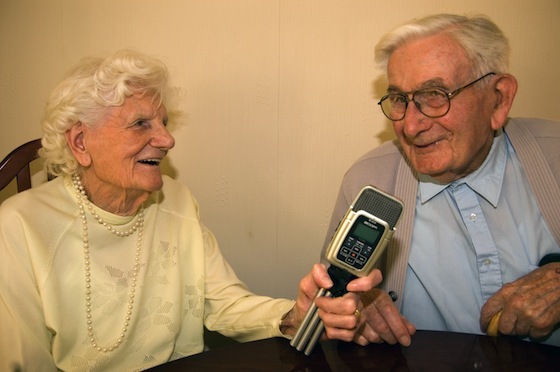 One of the project ideas that I always think is quite sad is young people using digital media to interview older people in the name of intergenerational work. To me, that is just reinforcing a stereotype that digital media is not for older people it’s for young people. Some of the best digital projects we have supported are run by older people. For example, Vintage Radio, a community radio station for the over 50s in Birkenhead, which was set up by and is run entirely by over 50s. They have built such a name for themselves that they now run training for young residents of the YMCA where they have their studio. This reversing of the stereotype is incredibly powerful I think! Watch Lynda’s story of her involvement here. We have also supported a group of older people in Reading who wanted to learn music technology and form their own band. Learning to play musical instruments on iPads has made a huge difference to their lives as they explain in this film. I’ve worked with some communities whose answer to anything always seems to be ‘yes’. These communities are so inspirational and their ‘can do’ attitude means that they achieve such a lot. But not every community is naturally like this. We’ve all been a part of groups where tensions are apparent, and they stem from the fact that everyone cares so much about the cause they are involved in, which in itself is no bad thing. I have worked with some communities, though, where factions have become apparent, friendships have been broken, and members have left the group because of these tensions. Managing this dynamic is tricky, and ultimately it does affect the project at hand. A light touch is always the best in these situations I have learned, after all, for us this is a job, but for the people we work with it is their lives. Ultimately the happiness and empowerment of the people involved is the main goal and if digital outcomes have to be put to one side to achieve this then so be it. For people who are overcoming barriers in order to use digital technology, and who are using it to speak out about issues personal to them they need their own time and space to develop their projects. Activities may not always happen to plan, and outcomes may not be achieved exactly on time, but allowing the project to be community lead and to develop in the communities’ own time is key. The outcome can still be incredible, even if it is late according to your timescale. One such project I have worked with is a youth club for people affected by HIV and Aids who wanted to make an animated film. It was important to them to make sure everyone was involved and that the young people were able to tell their stories, this was a long process and has meant that the film has been made slightly late according to the timescale of Community Voices, but as you’ll hear in this audio the result has been incredible.